A degree in healthcare can help change lives. Healthcare is evolving at an incredible pace. New technologies, procedures, and methodologies are creating opportunities across a broad spectrum of positions. And with our population growing and aging, demand for highly qualified healthcare professionals is on the rise. If you’re ready to step up and fill vital roles in the field or pursue career advancement, now is the perfect time to start. That’s why Maryville University offers a range of online healthcare degrees — each designed to prepare you for success wherever you healthcare passion leads you. These bachelor’s and master’s programs can be completed online, on your schedule, so you can prepare to follow your passion and serve healthcare organizations in non-clinical roles. Which online healthcare degree is right for you? Healthcare is a broad and growing field, and there’s opportunity everywhere for you to discover. At Maryville, we offer a variety of online healthcare degrees to match your career aspirations, whether you’re an established professional or just getting your start in the field. Learn more about our online Master of Health Administration. This online degree is designed to give you a liberal arts background that can complement your coursework in non-clinical healthcare topics. This 128-credit program covers general education, core courses, and healthcare core courses. Learn more about our online Bachelor of General Studies with a concentration in Healthcare. This program covers management, human resources, communication, information systems, and more. Complete a practicum and capstone course to help you advance your skills and prepare to succeed in your desired field. Learn more about our online Bachelor of Healthcare Management. As healthcare improves and America’s baby boomer population ages, our perception of senior living is changing. And today’s seniors expect more out of their assisted living experience. This means demand is on the rise for qualified senior living leaders and professionals. If you have a passion for helping people live their best lives, our bachelor’s in senior living management can help you reach that goal in an exciting, evolving field. This program was built to follow the NAB 5 Domains of Practice, and it features an experiential component to help you prepare for real-world practice in senior living management. Learn more about our online Bachelor of Science in Senior Living Management. Why choose Maryville for your online healthcare degree? When it comes to an online healthcare degree, Maryville has a reputation for offering an exceptional curriculum in an online environment. You don’t earn the accolades we have without providing academic excellence at an economic value. It’s all part of our student-focused commitment to helping you succeed. In fact, we’ve been bravely providing high-quality, accessible education since 1872. And we are established and respected in the fields of healthcare and nursing, having offered degree programs in those disciplines for more than 45 years. So when you earn your online healthcare degree at Maryville, you’ll have access to a program backed by history, focused on the future, and taught by real-world healthcare practitioners. Why earn your bachelor’s or master’s degree in healthcare online? You want to advance in your education or career, but you also have a life — and a busy schedule that goes with it. And whether it’s a bachelor’s or a master’s, pursuing your healthcare degree online just makes sense. When you earn your online healthcare degree at Maryville, you get more than online flexibility and convenience. You get support from application through graduation and beyond — with access to expert faculty practitioners, your academic advisor, and a dedicated technical support team. That’s because we are committed first and foremost to your success. Our curriculum doesn’t just fit into your life — it works around your life in every way. Complete your coursework 100% online and apply with no application fee. Connect with faculty experts who work with your schedule. Benefit from dedicated 24/7 technical support. Start when it’s convenient for you — fall, spring, or summer. What careers can you pursue with your online healthcare degree? If you’re looking for choices, pursuing an online healthcare degree can be an excellent decision for your career. Your healthcare degree can open the door to a wide range of potential career paths with median salaries and growth potential that exceed many other industries. The U.S. Bureau of Labor Statistics projects that demand for medical and health services managers will increase by 20% from 2016 to 2026, and the median salary for these positions in 2017 was $98,350 per year. As the baby boomer population ages and the population grows, your online healthcare degree can help you find opportunities to serve people, fill vital non-clinical roles in healthcare, and advance your career in the field. You can begin your career journey in many of these roles with a bachelor’s degree related to healthcare or health management. But for some positions, especially those in management or administration, employers may prefer a master’s degree. Meet our online healthcare degree faculty. Healthcare administration is serious business. Doing your job well can not only change lives, it could save them. So, when you’re earning your online healthcare degree, you want make sure you’re learning from experts in the field. Maryville’s online healthcare faculty are proven leaders in the industry with real-world experience and a passion for helping create the next generation of healthcare leadership. Professor Karen Schechter leads our healthcare management degree program. 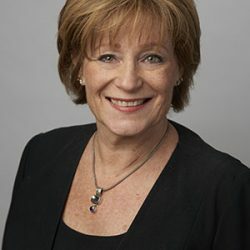 She brings more than 30 years of experience working in healthcare management consultant services, and has practical expertise in areas like strategic planning, practice startups, process improvement, compliance, and revenue cycles. Her decades of experience in high-demand areas make her an invaluable resource for our students. You can learn from practiced professionals like Professor Schechter and many more when you earn your online healthcare degree from Maryville.